Named “Home of the Blizzard” by Sir Douglas Mawson during the 1911-13 Australasian Antarctic Expedition, this rarely visited part of Antarctica was in fact the location of the very popular film “March of the Penguins”. 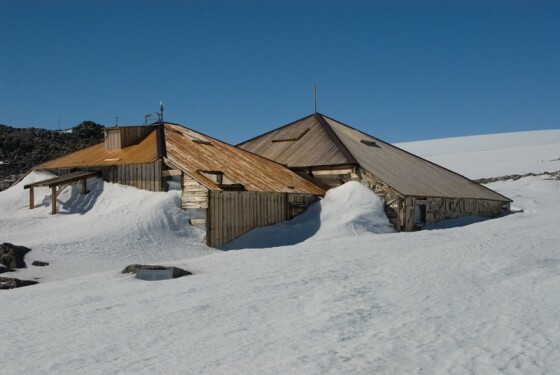 The remains of Mawson’s Hut at Commonwealth Bay is a piece of Antarctic history few people have ever seen. The French Base nearby welcomes visitors. Because ice “breaks out” early in the season it is a great place for wildlife. East Antarctica derives its name from the fact that nearly all of it lies in the Eastern hemisphere. East Antarctica is a high plateau covered by a vast, thick ice sheet and is divided from West Antarctica by the Trans Antarctic Mountains. East Antarctica includes regions claimed by Norway, Australia and France. The Australian claim is by far the largest, it extends from 45º E to 160º E except for a thin slice of Frances Terre Adelie which extends from 136º E to 142º E.
The areas of this region that have significant human history are spread rather sparsely along the thousands of kilometers of coast. Two particular sites interest us on our East Antarctic Expeditions. The French base at Dumont d’Urville. The base was named for the French explorer Jules-Sebastien-Cesar Dumont d’Urville and is located on Petrel Island in the Geologie Archipelago. This was near the site that Dumont d’Urville landed in 1842. This station replaces the original French Station at nearby Port Martin which was burnt down in January 1952. One of the better known (especially to Australians) historical sites is Commonwealth Bay. The Australasian Antarctic Expedition led by Douglas Mawson was based here from 1912-14. The bay takes its name after the Commonwealth of Australia. Mawson referred to it as the “Home of the Blizzard” because of the strong katabatic winds that blow here almost everyday. Remains of the 1912-14 expedition buildings still stand. Conservation of these huts is difficult because of the extreme weather conditions. The Mawsons Hut Foundation, based in Australia has carried out some restoration work and more is planned. Mawson originally intended to have two separate huts, but it was decided instead to join the two together. This hut still stands as do the Magnetograph House, the Magnetic Absolute Hut and the Transit Hut. A memorial Cross to Mertz and Ninnis who perished on this expedition is located on a small hill to the west of the main hut. Although not a physical historic site, the South Magnetic Pole is a significant site. It featured a lot in the early exploration of the Ross Sea region. Today this “wandering” pole is located in the southern ocean off the coast of East Antarctica in the vicinity of Dumont d’Urville and Commonwealth Bay. There is a large Emperor Penguin colony adjacent to Dumont d’Urville. This is the location of the film 'March of the Penguins'. There are numerous Adelie penguin colonies scattered along the coastline. Breeding on the continent and on the many small islands are Wilson’s Storm Petrels, Snow Petrel (probably both Lesser and Greater), Antarctic Petrels, Antarctic Fulmars and Polar Skuas, Crabeater, Weddel and Leopard Seals are common. The taxonomic order and nomenclature follows Clements 5th edition (updated 2005). Ayres, Philip - Mawson – A Life, The Miegunyah Press 1999. Fletcher, H - Antarctic Days with Mawson, Angus and Robertson, 1984. Hall Lincoln - Douglas Mawson – the life of an explorer, New Holland Publishers, 2000. Larsen, C - South with Mawson, Australasian, 1947. Mawson, D - The Home of the Blizzard, Heinemann, 1977. McIntyre, D - Two Below Zero: a year alone in Antarctica, Australian Geographic 1996.